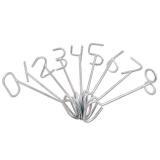 Rounded paint branding irons make fast drying, clean, visible numbers on animals. Use with SI-RO-MARK™ Marking Fluid. Used to brand animals with marking paint. Hot-dip galvanized for extra life. Made of wire rod. Uses less fluid per mark, smears less and dries faster than flat brands. SI-RO-MARK fluid is the only sheep marking fluid approved as properly scourable by all of the world's leading wool processors. Use to control the flow of sheep and goats through handling systems. Galvanized steel. 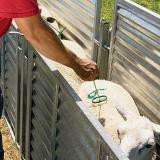 In sheep handling systems, curved panels provide the "bugle"(one that curves as it narrows) entry. Good bang for your buck with these marking brands. Nothing fancy, but neither am I. These make a clearly marked number. Just what I was looking for and the price was right. 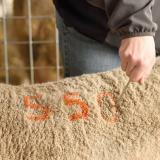 We purchased these paint branding irons to brand lambs with the mothers number. this worked very well for us as we can associate lambs with mothers at a distance. 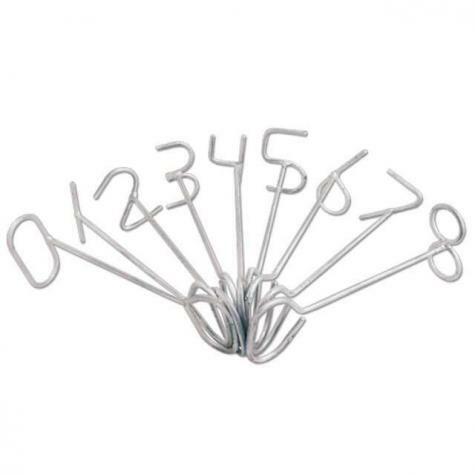 These round irons leave a neat and easy to read number. We put the ewe's number on her back also. We have Dorper hair sheep. These irons make a clear crisp mark. I'll never go back to spray paint.